By Scott Gilfoid: WBA heavyweight champion David Haye (25-1, 23 Ko’s) has steadfastly refused to shake hands with the talented IBF/WBO heavyweight champion Wladimir Klitschko (55-3, 49 KO’s) in their two press conferences, as if Wladimir has the cooties. Each time Wladimir has reached out his hand to Haye to show what a good gentleman he is, Haye has turned his head away and refused to shake his hand. Not only that, Haye won’t always answer questions that Wladimir asks him. It’s like watching an obstinate child who is sulking. 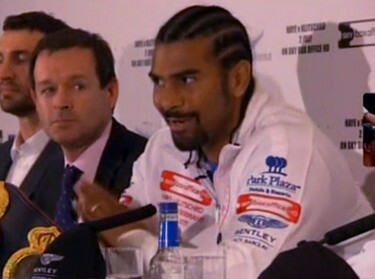 Haye has clearly gotten the worst of it verbally from Wladimir in their first two press conferences. It’s embarrassing to see Haye unable to fight back in area that he’s usually in control of. However, Wladimir has really come into the press conferences prepared with jokes and insults. He’s also done a good job of winning over British fans by complimenting the UK and showing his class. Does that sound childish to you? I swear it’s like we’re dealing with an infant. It’s no skin off of Wladimir’s teeth whether Haye shakes his hand or not, but you got to at least fake it while you’re in front of the press, don’t you? It’s sad to see Haye regressing like this. He needs to man up and shake Wladimir’s hand and be adult about the whole thing. It gets things off to a bad start with Haye already acting up. I just hope he doesn’t take his anger into the ring and go rabbit crazy with the punches behind the head. I’d hate to see another replay of Haye’s fight against John Ruiz where Haye was teeing off on Ruiz with some of most beautiful textbook rabbit shots I’d ever seen before. The arc that Haye was getting into his rabbit shots was incredible.